Before we read more .. .. this offie played with little success (2 ODIs 2 wickets) – 24 tests – 53 wickets in a career spanning 7 years – never played against India !! – but in news !! Brief Scorecard summarises : India 7 for 443 dec (Pujara 106, Kohli 82, Agarwal 76, Rohit 63*) and 8 for 106 dec (Cummins 6-27) beat Australia 151 (Bumrah 6-33) and 261 (Cummins 63) by 137 runs. Though it provides great comfort now, this morning Indians were scratching google and had started criticizing Ravi Shastri and Kohli for not enforcing follow-on and chosing to bat again and lose wickets in a heap .. .. for the first session on day 5 was washed out – India needing 2 wickets and Cummins seem to bat to eternity. The web search on Google Trends for 'Melbourne weather' from India went through the roof but in the end, it took them just 27 balls to retain the Border-Gavaskar trophy. .. .. then after early lunch – match resumed, Bumrah claimed Cummins. "The credit has to go to our bowlers, especially Jasprit, they have been outstanding," Kohli said after the game. "The way Jasprit bowled in Perth it was almost criminal not to get wickets, but the management told him they would come in bunches." 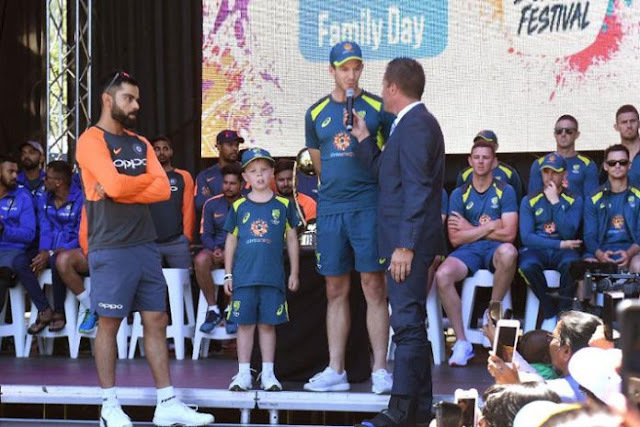 Australia had managed to take the match into the final day and the first part of Sunday was spent with the teams kicking their heels in the dressing room as showers scudded across the ground. Any early lunch was taken at 12.15pm but during the interval, the skies cleared to allow India to resume their quest. The new-ball was only five overs old and was in the hands of Ishant and Bumrah, the latter immediately making life uncomfortable with his angle and bounce as he has throughout the match. Cummins had put Australia's top order to shame with his display, and there were hopes of a maiden Test hundred and threatening a go at the target were there – relieved to see them vanish when Bumrah found the outside edge and Cheteshwar Pujara, the man who set this all up for India, grasped a good low catch at first slip. There was no final-wicket stand to annoy India when Ishant sent down a bouncer to Lyon who hooked and sent the top edge to Rishabh Pant to allow the celebrations to begin. The Border-Gavaskar trophy has been retained, a wonderful end to 2018 for India, but an even bigger prize awaits in Sydney at the start of the New Year. "Nothing will distract us from winning that last Test," Kohli said, "we've worked really hard for this." Australian captain Tim Paine took a thinly-veiled swipe at both the MCG and SCG curators, lamenting the state of pitches that the skipper suggested had played into India’s hands. The Australians are expecting the SCG wicket to turn, calling in Queensland spinning all-rounder Marnus Labuschagne to their squad. You never go to India and get served up green wickets. And they’ve come out here and we’ve served some wickets up that have really suited them. Having said that they’ve outplayed us and we’ve got to go to Sydney and improve." Australia captain Tim Paine tormented by Rishab Pant as ‘temporary captain’ has thrown out the welcome mat to exiled duo Steve Smith and David Warner as selectors contemplate ringing the changes after a 137-run defeat in the third Test. Selectors have sent an SOS to rookie Marnus Labuschagne by including him in what is now a 14-man squad for the Sydney Test, leaving opener Aaron Finch and all-rounder Mitchell Marsh sweating over their futures after Australia's problematic batting failed in Melbourne. 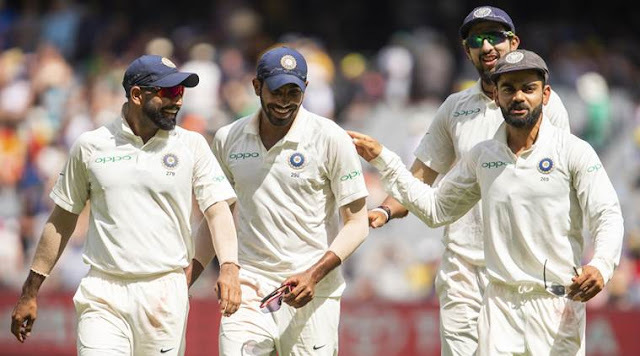 Earlier - Commentator Kerry O'Keeffe has responded to the anger of India's team over his on-air comments during the Boxing Day Test at the MCG. On day one of the Test, O'Keeffe had run down debutant Mayank Agarwal's Ranji Trophy triple-century, saying it must have come against the "'Jalandhar Railways Canteen Staff". Then on day 4 O'Keeffe was getting some stick from his fellow commentators for struggling to pronounce some of the India players' names, when he said this: "Why would you call your kid Cheteshwar Jadeja?" mixing up the two names he had been struggling with and using a slight accent to pronounce them. It was accompanied by loud chuckles from the rest of the commentary box. Both comments caused plenty of social-media backlash from Indian fans against O'Keeffe. While the Test featured plenty of banter between the players, the chat off the field wasn't all in good taste. Mitchell Marsh and Virat Kohli have been booed by the MCG crowd, and some of the spectators in the infamous Bay 13 had to be evicted after they were heard making racist chants of "show us your visa. Spectators in the MCG's famous Bay 13 were ejected and others warned after racially motivated taunting of Indian players and spectators raised multiple complaints over the first three days of the Boxing Day Test in Melbourne. Chants of "show us your visa" were a regular feature of the first two days, leading to a formal warning from Cricket Australia to spectators in the public area in the bottom tier of the MCG's Great Southern Stand that if the chanting did not stop then the entire bay would be ejected from the ground. Monitoring of the crowd on day three led to several fans being evicted. A CA spokesperson said: "Cricket Australia takes a zero tolerance stance against any form of abuse or racial vilification at any of our matches, whether it be towards fans, players, or staff. 2018 ended on a high note for the Indian bowlers – in 1970s – there was the famous spinning quartet – Bishan Bedi, Erapalli Prasanna, Bhagwat Chandrasekhar and Srinivasan Venkatraghavan – Kapil Dev’s debut sought to change the way Indian bowling attack was – though there were to be Doshi, Shivlal Yadav, Maninder, Laxman Siva, Kumble, Harbhajan, Ashwin and more .. .. Indian team too now has classy pace bowlers .. on this tour we have Jasprit Bumrah, Ishant Sharma, Mohammad Shami doing so well with Bhuvneswar Kumar and Umesh Yadav & Hardik Pandya in the ranks. The 70s and 80s clearly belonged to those fearsome pacers of the Caribbean - Andy Roberts, Michael Holding, Joel Garner, Colin Croft. .. .. there were many others to follow including Patrick Patterson, Ambrose, Walsh, Bishop and .. .. and in 1984 the legendary trio of Joel Garner, Michael Holding and Malcolm Marshall took 130 wickets. That stands broken with Indian trio of Jasprit Bumrah, Mohammed Shami and Ishant Sharma taking 136 wickets in 2018 (please don’t jump to say that they are not in the same league !) ~ the next in the row is the South African pace trio of Morne Morkel, Makhaya Ntini and Dale Steyn who managed to take 123 wickets in 2008. 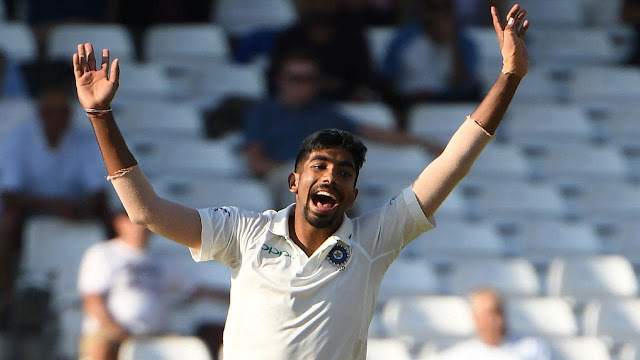 Bumrah has finished with 48 wickets in nine Tests, Shami 47 (12) and Ishant 41(11). Fifteen wickets tumbled on day 3 today at maligned MCG pitch as a deck which had been slammed for being ‘fl aaa t’ lifeless belatedly delivered joy for the bowlers. It is not often one would still relish a happy feeling when 5 down for 44 .. as Pat Cummins reduced India to shambles – we have not seen Cheteshwar Pujara & Virat Kohli failing to open their account – Hanuma Vihari not the right guy to open, Ajinkya Rahane and Rohit Sharma too getting out – Rishab Pant out in the middle with debutant Mayank Agarwal .. .. Indian fans are hopeful of a win here and – the coveted Border-Gavaskar trophy too ! – let us wait for a day more for that !! ~ the belonged to Jasprit Bumrah, called a “genius” on air by Australia’s former captain Michael Clarke. Bumrah’s career-best figures of 6/33 in 15.5 overs made him the first bowler from the subcontinent to take a five-for or more in South Africa, England and Australia in the same year. 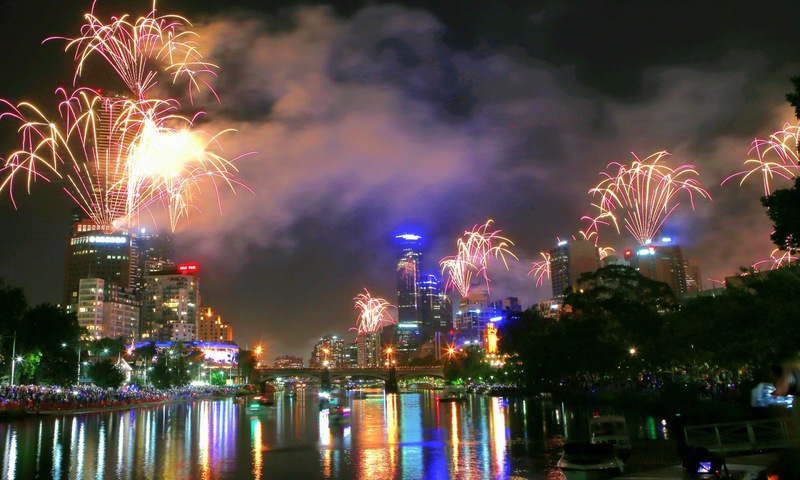 Melbourne is gearing up for New Year celebrations with glittering fireworks (whether they are eco-friendly, whether they will emit obnoxious gases are out of Q as there is no Supreme court ban over there !!) From a top-secret location, white vans are being packed with explosives and transported around the Melbourne CBD for a New Year’s Eve fireworks display promised to be like nowhere else in the world.From the ground to the tops of 22 buildings and spread over a 7km radius, 14 tonnes of fireworks worth $234,000 will be set off to welcome 2019.Design work started in March for the 10-minute sound and light show, set to music of Indigenous rapper Adam Briggs, and dozens of workers have already spent more than a week setting it up.This year’s special effects include flying dragons, swirling across the sky like the mythical creatures they’re named for, and the personal favourite of display manager Rusty Johnson, the spider shells with their eight distinctive legs weaving a web over the city. Will Australia bite the dust ? ~ there is already much firework off the field – by the interview and follow-up of the ball-tampering episode. It’s long been alleged that David Warner issued the "code red" on Cameron Bancroft. That Warner asked the junior player to carry out the dirty work of scratching the ball with sandpaper. Not sure, if Bancroft and Warner have spoken to each other since the South African tour, but the Bancroft interview with Adam Gilchrist seems like the junior opener wanted to throw Warner under the bus. He definitely got the jump on Warner and it seemed like payback in full.How could these two guys open the batting together again? Back on the ground at famous MCG India declared their first innings at 443 for 7 down (C Pujara 106, V Kohli 82; P Cummins 3-72); had Aussies pinned down – 151 all out 151 (M Harris 22, T Paine 22; J Bumrah 6-33). If one hailed declaration by India as an aggressive move, it will be too difficult to explain why follow-on was not imposed and why India chose to bat and ended the day at 5-54 (M Agarwal 28no, H Vihari 13; P Cummins 4-10) – the oft repeated excuses would be giving breather to bowlers and avoiding playing the last innings. Aussies were bowled out in 66.5 overs and other than Jadeja it was Bumrah who bowled 16.5 – so rest was not the answer. If follow-on had been enforced, India had a huge 291 run lead – Australia could not have exceeded this to make India bat again – and if so, the chase should have been for a small number .. so what explains the illogical decision of chosing to bat through ! ~ anyway, India need not think of another possible declaration as Cummins has almost closed them with his incisive spell. Cummins, on a hat-trick, gave the 33,447 fans plenty to cheer about late but India looms as the only team that will emerge triumphant.His outstanding spell left many wondering what could have been had Australian shown more application with the bat. The Indian score of 5/54 still translates to 346 ahead. Given the way Australia surrendered in their first innings, India most likely have enough already. History suggests they have.The highest fourth-innings run chase in Melbourne is 332, set way back in 1928-29. The home team's technical deficiencies were brutally exposed by a clinical Indian attack which ruthlessly dismantled Justin Langer's inexperienced batting line-up. Apart from Shaun Marsh, who was befuddled by a wicked slower ball from Jasprit Bumrah, their frontline batsmen triggered their own downfall.Though Marsh has been applauded by teammates for his role with the ball here, he has made only 119 at 9.9 since his agenda-setting 96 in Durban.Australia capitulated for 151 in only 67 overs on a pitch that had been slammed by critics for being too friendly to batsmen. At the corresponding stage of their first innings, India were 2/165. Four Indian players faced 100 balls, none did for Australia. 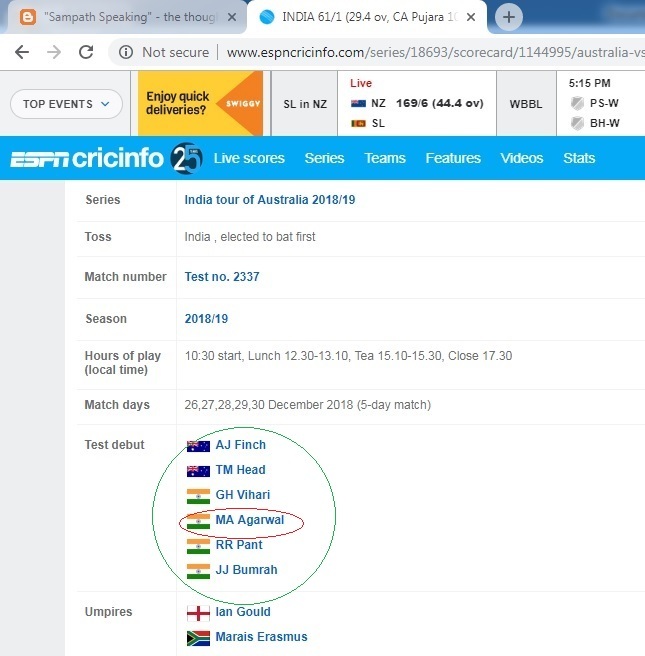 Six Indians passed 30, Australia's top score was 22. Jasprit Bumrah with sling action was the destroyer, claiming a career-best 6/33 – the third best return by an Indian bowler behind Anil Kumble and Kapil Dev. The paceman with the short run-up and unorthodox action attacked the stumps and was rewarded grandly. Bumrah's slower-ball yorker to Shaun Marsh was a stunner, swerving late and dipping under the bat to find his pad. The tail were also no match for Bumrah, who completed his haul with a pair of thunderbolts. Has Kohli and the coach Ravi Shastri denied Bumrah capitalising his dream spell with another sling at the opposition for the 2nd innings ? – enforcing follow-on and having at least half of Aussie back in pavilion would have been a much much better option. .. .. let us wait for that final punch. I had posted on this interesting piece of statistics in Oct 2018 – Indian openers have made a solitary 100 opening stand while on tours of England, South Africa, Australia & New Zealand (between 2009 – 2018) [England 28 innings – high 63; SA 16 innings – high 137; Australia 16 – 56 highest; New Zealand 10 – 73) – and we say – players succeed in teams, in tandem with partners. At Chepauk I was thrilled to see Sunil Gavaskar walking out with Krishnamachari Srikkanth – and there was this pair - Gavaskar and Chetan Chauhan ! Back in 1983, when WI visited immediately after their loss in WC 1983 – it was unbeatable, fearsome team – the little master very strong in defence sunil Gavaskar was threatening not to open, having had various partners including Eknath Solkar, Farokh Engineer, Parthasarathi Sharma, Anshuman Gaekwad, Chetan Chauhan, Pranab Roy, Krish Srikkanth,Arun Lal, Ghulam Parker – to name a few. Indian selectors were seriously searching for good openers – and Rajan Bala wrote – ‘who is to partner CS Sureshkumar’ – underlining that the TN Opener had the correct technique and in the absence for Sunil, Selectors should find someone who would open with CS Suraishkumar, who had many tons in Ranji. ~ and today at Melbourne, India has an interesting combination of debutant Mayank Agarwal and .. .. Hanuma Vihari. To his credit, the makeshift opener Vihari scratched around for 66 balls made 8 and was out on 18.5 with score on 40. Sadly, that is the longest tenure for Indian opening pair since July 2011 in England / Australia / New Zealand / South Africa. Today a sluggish surface in the first hour quickened up just enough in the second to allow Pat Cummins to bounce out Hanuma Vihari, but the early use of Nathan Lyon and the posting of only one Australian slips fielder for much of the morning suggested that attritional cricket would again be the order of the day at the MCG. Patience was required of both batsmen and bowlers, and intriguingly it was the allrounder Mitchell Marsh who gained the most challenging sideways movement for the debutant Mayank Agarwal and Cheteshwar Pujara. In the luncheon interval, Harsha Bhogle was to ask, how many ‘aaa’s to put between this pitch description as ‘ f l a t’. 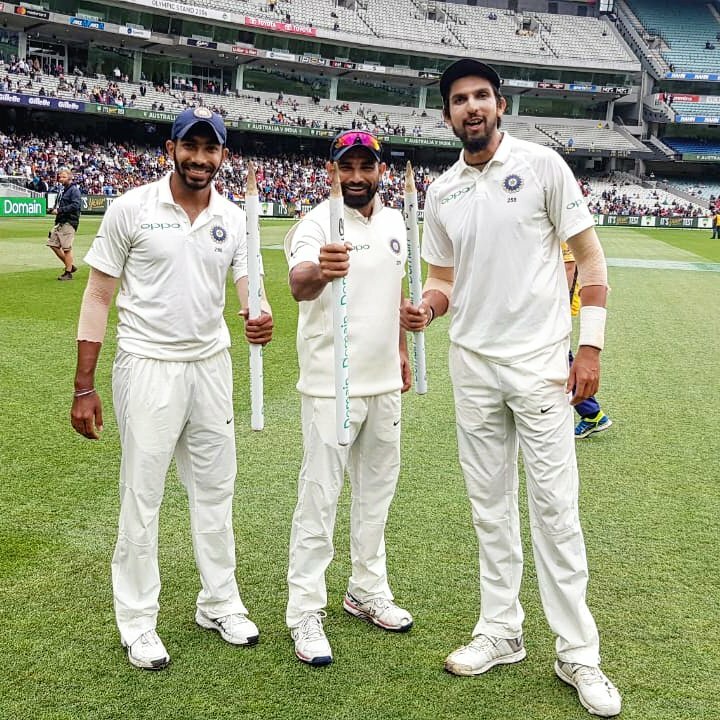 Poor M Vijay and KL Rahul, must be looking at this pitch and wondering why they never get such gifts. There have been many a successful opening pairs like Hayden/Langer; Greenidge/Haynes; Cook/Strauss; Gibbs/Greame Smith; Imrul Kayes/ Tamil Iqbal ! ; Chetan Chauhan / Sunil Gavaskar and more .. India need to patiently wait for a decent pair – could it be Mayank Agarwal / Prithvi Shaw. Cricinfo is a treasure-trove for statistics but it got this wrong – the debutant list as one could see on its web – only Mayank is making debut – not the rest. There have been reports of Cricket Australia planning to bring back Steve Smith and David Warner – meantime, comes this news piece. Cameron Bancroft has confirmed for the first time that David Warner encouraged him to try to tamper with the ball in Cape Town with the tacit approval of the captain Steven Smith, leading to a scandal that saw all three banned from the game while Cricket Australia dealt with a host of cultural repercussions. The week after Smith revealed he had been aware of conversation between Warner and Bancroft about possible ball-tampering and stated "I don't want to know about it", thus allowing the events that followed to take place, Bancroft said that he had accepted the then vice-captain's advice because he "just wanted to fit in and feel valued" in the team. "Dave [Warner] suggested to me to carry the action out on the ball given the situation we were in in the game and I didn't know any better," Bancroft told Fox Sports. "I didn't know any better because I just wanted to fit in and feel valued, really -- as simple as that. "The decision was based around my values, what I valued at the time and I valued fitting in … you hope that fitting in earns you respect and with that, I guess, there came a pretty big cost for the mistake. I would have gone to bed and I would have felt like I had let everybody down. I would have felt like I had let the team down. I would have left like I had hurt our chances to win the game of cricket. "I take no other responsibility but the responsibility I have on myself and my own actions because I am not a victim. I had a choice and I made a massive mistake and that is what is in my control." Having been handed a nine-month ban by CA, as opposed to the one year penalties given to Warner and Smith, Bancroft is due to make his return to domestic ranks in the Big Bash League game between Perth Scorchers and Hobart Hurricanes in Launceston on December 30. In the intervening months he has worked to broaden himself, taking up yoga and reading widely in addition to the CA-imposed order to do community work and playing club cricket in The Northern Territory and also his home town of Perth. The Chutiya Kingdom (1187-1673), a state established by one of the Chutiya chieftains named Birpal in 1187 CE in the areas comprising the present-day Indian states of Assam and Arunachal Pradesh is in news today. It was the largest kingdom in Assam after the fall of Kamrupa and before the rise of Ahom kingdom. The kingdom absorbed the ancient Pala dynasty of Kamarupa and reigned for over 400 years in eastern Assam and Arunachal Pradesh with its capital at Sadiya and Ratnapur. One may not know History, but how many of the political pundits still remember Assam Accord ? The Assam Accord (1985) was a Memorandum of Settlement (MoS) signed between representatives of the Government of India and the leaders of the Assam Movement in New Delhi on 15 August 1985. A six-year agitation demanding identification and deportation of illegal immigrants was launched by the All Assam Students’ Union (AASU) in 1979. It culminated with the signing of the Assam Accord. Though the accord brought an end to the agitation, some of the key clauses were not implemented and one important aspect culminated today. For those not so well informed the signatories were : Prafulla Kumar Mahanta, Bhrigu Kumar Phukan – RD Pradhan, PP Trivedi in the presence of the then PM of India, Mr Rajiv Gandhi. Today is historically significant as Prime Minister Shri Narendra Modiji opened the Bogibeel railroad bridge in Assam, India's longest railroad bridge. Its foundation was laid in 1997. The five-kilometre structure spans the waters of the mighty Brahmaputra River. Bogibeel bridge connects Assam's Dibrugarh and Dhemaji districts, bordering Arunachal Pradesh. It will cut the travel time between the two points by four hours and help avoid a 170-km detour. With its proximity to the China border, the bridge also has tremendous significance for India's defence and has been built strong enough to support the movement of tanks and even fighter jet landings. Designed like a bridge that links Sweden and Denmark, the Bogibeel Bridge is India's only fully-welded bridge for which European codes and welding standards were followed. A fully welded bridge has a low maintenance cost, its engineers say. The bridge, which also happens to be Asia's second longest rail-and-road connector, has a lifespan of around 120 years, authorities have said. 3. The bridge has a two-line railway track on the lower deck and a three-lane road on the top deck. It will reduce the Delhi to Dibrugarh train travel time by about three hours. The 4.9 km-long bridge was constructed at an estimated cost of Rs. 5,900 crore - exceeding its initial budget of about Rs. 3,200 crore and originally planned length of 4.31 km. The foundation stone of the project was laid by former Prime Minister HD Deve Gowda on January 22, 1997, while work began on April 21, 2002 under the Atal Bihari Vajpayee-led government. December 25 happens to be Vajpayee's birth anniversary. The bridge will be a massive help for residents of the remote districts of Anjaw, Changlang, Lohit, Lower Dibang Valley, Dibang Valley and Tirap in Arunachal Pradesh besides the Dibrugarh and Dhemaji districts in Assam. The Bogibeel bridge traces its origins to the Assam Accord of 1985 and was one of several major infrastructural projects to be set up in Assam in accordance with the pact. Though it was sanctioned by the Government of India in 1997-98 and was expected to be completed by the end of the Ninth Five Year Plan with foundation laid in Jan 1997 by the then PM Mr H.D.Deva Gowda; it did not take off and its construction was inaugurated only in 2002 by Prime Minister Sri A.B. Vajpayee. After several years of slow progress, the Bogibeel bridge was granted a national project status by the Government of India in 2007 by Prime Minister Mr Manmohan Singh. It has come a reality in Sri Modiji era. Modiji inaugurated the bridge and addressed a rally – said , : "We have changed the earlier 'latkane bhatkane' (dilly-dallying) work culture... Completion of projects within a time frame is no longer confined to paper but has become a truth in the real sense.” He added, “If Vajpayee had a second term, Bogibeel Bridge would have been ready by 2008-09. After his government, no attention was paid to the project till 2014.” Asserting that the Bogibeel Bridge will strengthen the country's defence prowess with movement of vehicles and trains, he said, it is not only a bridge, it is a lifeline for crores of people in Assam and Arunachal Pradesh. Prime Minister flagged off the Tinsukia-Naharlagun Intercity Express, which will run five days a week and use the 4.9-km bridge to cut down the train-travel time between Tinsukia in Assam to Naharlagun town of Arunachal Pradesh by more than 10 hours. Itanagar, the capital of Arunachal Pradesh is just over 15 km from Naharlagun. Really a good day (ache din!) for the Nation. 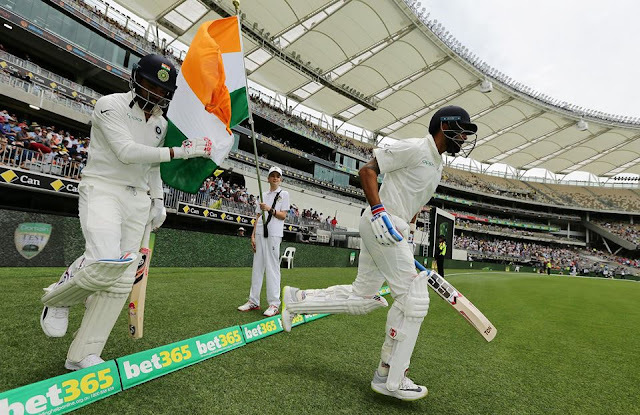 Melbourne 'boxing day' test - India drops both openers ! Cricket Australia’s most powerful figures have started discussions regarding Steve Smith and David Warner’s reintegration, with a pair of ODIs against Pakistan looming large. Smith and Warner’s year-long bans are set to expire in the middle of a five- match ODI series that will run from March until early April. All that appears well planned – CA sprung into action before ICC announced the punishment for the crime – and now Cricket Australia (CA) chief executive Kevin Roberts and national coach Justin Langer are both keen to focus on the task at hand, a four-Test series against India that continues on Boxing Day. The test match is played at Melbourne Cricket Ground (MCG) located in Yarra Park, Melbourne, home to the Melbourne Cricket Club. It is the tenth largest stadium in the world, the largest in Australia, the largest stadium for playing cricket, and holds the world record for the highest light towers at any sporting venue. The MCG is within walking distance of the city centre and is serviced by the Richmond railway station, Richmond and the Jolimont railway station, East Melbourne. Internationally, the MCG is remembered as the centrepiece stadium of both the 1956 Summer Olympics and the 2006 Commonwealth Games. The open-air stadium is also one of the world's most famous cricket venues. 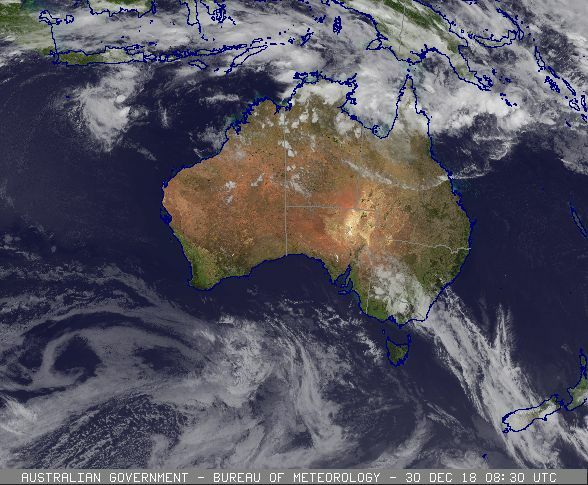 December 26th is celebrated down under as Boxing day – it is a public holiday there in Australia, Canada, New Zealand and some commonwealth Nations. Some say its origin is from the Christmas carol and King Wenceslas. Another plausible theory is that one day after Christmas, the boxes are broken open ! In UK, there reportedly is the tradition of fox hunts in country sides which were imperiled since 2005 with Parliament banning traditional method of using dogs to kill prey. Down under the tradition continues (one remembers the Pongal test tradition at Chepauk that has died down !) – a Test match hosted at Melbourne, Victoria, beginning on Boxing day – the 26th Dec ; every four years the Boxing Day Test forms part of the 5-match Ashes series with England. India has won twice at Melbourne ~ thus a favourite ground for the team. Of our two wins at Melbourne, the latest one came in Feb 1981 – a Test which was almost sparred by ‘smoke was coming out of my ears and I heard nothing’ comment of Sunil Gavaskar. In Test No. 895, Indians led by Gavaskar, made 237 with a brilliant 114 by Gundappa Vishwanath. Lillee scalped 4, Pascoe took 3. Aussies made a massive 416. India had the best partnership of 165 when Gavaskar was adjudged LBW to Lillee when he had nicked it on to his pads. Chauhan went on to make 85 and Indians made 324 – a target of 143 looked simple and Kapil was not fit to bowl with a strained thigh muscle. But in the dramatic last session Aussie lost 3 wickets for 24. Ghavri removed Jack Dyson; Wood was out to Doshi and Greg Chappen was out bowled by Ghavri for a first ball duck. The next morning Kapil dev fired them out with figures of 5 for 28 bundling them out for 83 – one of the lowest movements for Australia. Chetan Chauhan who batted so well – played in 40 Tests making 2000 odd runs but never made a century, though was closer many a times. Chauhan was urged by Gavaskar to walk out and leave the field but the manager Wing Commander S. K. Durrani, intervened, and ensured that the controversial dismissal did not spoil the match. The whole of the Series there was inconsistent umpiring always going against the Indians. The inexperienced Rex Whitehead, who made his debut in the first Test and stood in all three matches even after Indians protested. The first win in Dec 1977 was different. It was a great series in which all the 5 matches produced results. Indians were led by Bishan Singh Bedi; Australians brought back Bobby Simpson as some key players had joined Kerry Packer and were unavailable for National side. Aussies secured an early 2-0 lead and the 3rd Test (Test No. 812) was at Melbourne. Jeff Thomson was at his furious best and Indians straightaway were off to the worst imaginable start losing both the openers without a single run on board. Mohinder, Vishwanath, Vengsarkar and Ashok Mankad took the score to 256. Craig Serjeant made 85, while rest Dyson, Coiser, Ogilvie, Simson, Toohey, Rixon went out cheaply and were bowled out for 213. Chandrasekhar took 6 for 52. In the second India made an imposing 343 with Gavaskar making 118. Set an improbable 387, Aussies mustered only 164 giving Indians their first win – a big one at that. Chandra was the hero with another identical 6 for 52. The accomplishment of the first win in 12 tests in Australian soil was outrightly due to Chandra’s magical figures of 12 for 104 in the match. Now to the present ~ the series is interestingly poised at 1-1 - If India can bounce back from their Perth defeat and register victory they will have retained the Border-Gavaskar trophy. The pitches in this series have provoked much discussion and Melbourne's 22 yards has been at the forefront of everyone's attention for days. Last year the surface was marked "poor" by the ICC after the drab Ashes stalemate and this Test, under the management of a new curator, feels like a significant moment as an iconic ground tries to repair its reputation. Lot has been written about 7 year old Archie Schiller being drafted in Aussie side – it is more of a heart-warming gesture. Archie, who suffers from a heart ailment, dreams of captaining Australia and it has been confirmed he would co-captain Tim Paine in the third Test against India, starting December 26. Archie's inclusion in an extended Australian Test squad was made public earlier this month and he learned the news via a phone call from coach Justin Langer. The young leg-spinner also practised with the Australian team during a training session at the Adelaide Oval earlier this month. When Archie was just three months old, it came to light that he had faulty heart valves. Weeks after his birth he underwent an urgent surgery lasting more than seven hours in Melbourne. And six months later, he underwent a second surgery before he went under the knife again in last December. Paine said the decision to make Archie the co-captain was their way of fulfilling his long-cherished dream. "Sometimes we live a life, it's very good, but you can be consumed in your own life at times, so to have someone like that around is actually really inspiring for our group. It's great to have him around and we look forward to his debut on Boxing Day," he added. Interesting ~ and hope India bounces back .. .. wins another at Melbourne. Vaikunda Ekadasi, is a day of supreme significance for all Sri Vaishnavaites. Today 18thDec 2018 is the all important day. At Thiruvallikkeni divyadesam sung by 3 Alwars Uthsavar enters through the Paramapada vassal in the morning and in the evening in the subsequent nine days. 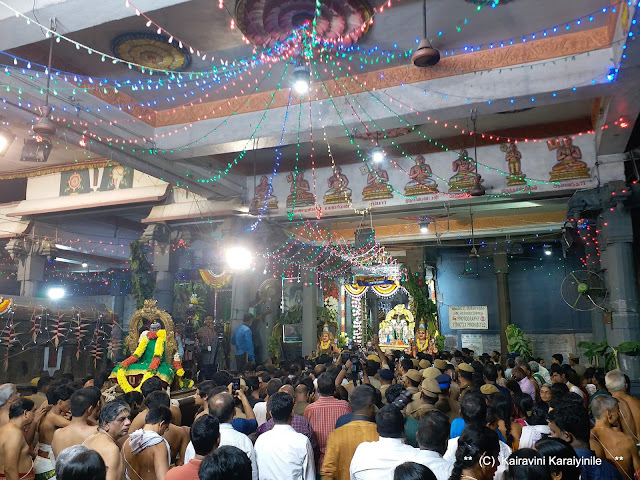 The 10 days starting from Vaikunda Ekadasi are celebrated as “Iraapathu uthsavam” Today, thousands of people thronged the temple to have darshan of Sri Venkata Krishnar (Moolavar) and Sri Parthasarathi (Uthsavar). Devotees feel enlightened and blessed, when they cross the entrance - Vaikunda door ~ the paramapada vasal. This morning around 0430am Lord Sri Parthasarathi had purappadu inside the temple and with Sri Nammalwar welcoming from the other side, entered the Paramapada vasal. It was indeed a divine occasion and devotees gathered in big numbers ~ when there are people, there is SYMA. Prominent members of Srinivas Young Mens Association in service to society since 1977 along with Triplicane Brahmins Welfare Association have been arranging distribution of quality food (Prasad) to devotees – in rotation it was Pongal, Puliyogaree, tamarind rice, Curd rice .. .. right from the morning till the night, SYMA volunteers served the people with quality food. Sakthi Hospitals, Triplicane too joined in this and stationed their nursing staff ready to provide first aid for any medical exigency. Here are some photos taken this morning. Secretary SYMA : 18th Dec 2018.
called racist ~ Gandhi's statue pulled down in Ghana ! We have seen statues of Lenin / Sadam Hussein fall ~ Berlin wall too stumbled but this statue on the university's Legon campus in Accra, Ghana removed overnight on Tuesday, by students and lecturers makes us feel sad. The head of language, literature and drama at the Institute of African Studies, Obadele Kambon, said the removal was an issue of "self-respect" ! ~ "If we show that we have no respect for ourselves and look down on our own heroes and praise others who had no respect for us, then there is an issue," he said. ~ and can you remotely think that to be the statue of our National leader – Mahatma Gandhi – there are streets in every metropolis – there are hundreds of statues (the one featured here is in a shop in Mumbai airport) – we see the statue in Marina (Gandhi beach) sculpted by Devi Prasad roy Chowdhury. In our school books we read that on 7th June 1893, in South Africa’s Pietermaritzburg – started a turn in Gandhi’s career, first act of civil disobedience, which eventually led to the formulation of his Satyagraha principles of peaceful resistance against the oppressive British Raj. It was on that day, Gandhi was evicted from a train in South Africa’s Pietermaritzburg station because the compartment he was in was reserved for “whites only”. A white man had objected to Gandhi travelling in the first class coach in spite of the latter possessing a valid ticket. When Gandhi refused to move to the rear end of the train, he was thrown out. He had stayed at the station that night shivering in cold and the bitter incident had played a major role in Gandhi’s decision to stay on in South Africa and fight the racial discrimination being faced by Indians there. His doctrine of Satyagraha subsequently took shape during Gandhi’s stay in South Africa. Sure you know of Cocoa bean……..almost all of us are addicted to chocolates. They are made of cocoa bean.... the dried and fully fermented fatty seed of ‘Theobroma cacao’, from which cocoa solids and cocoa butter are extracted. Republic of Ghana, located in Gulf of Guinea and Atlantic Ocean, in West Africa is famous for cocoa beans. Ghana, is a sovereign multinational state, 82nd largest country in the world and 33rd largest country on continental Africa by land mass. The word Ghana means "Warrior King". 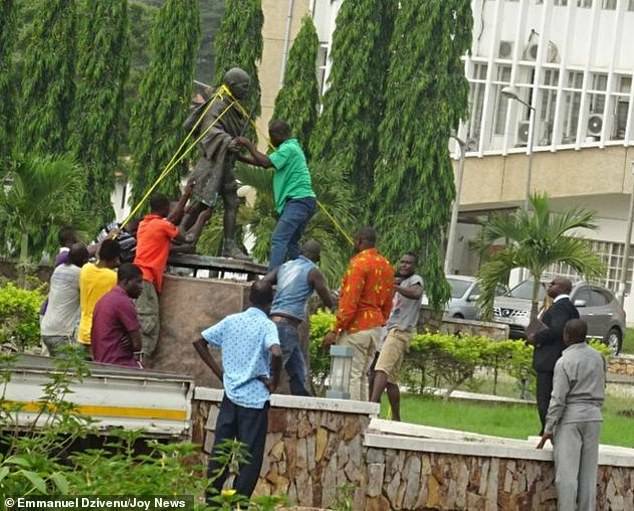 From Ghana comes that news of teachers and students ripping down statue of Gandhi unveiled by Ghana's president - saying the independence leader was 'racist' as a young man in South Africa – it was not sudden, but is the culmination of a campaign for removal that started almost immediately as it was unveiled in 2016. Media reports suggest that after campaigning for the statue's removal for two years, teachers at the University of Ghana in the country's capital Accra took matters into their own hands on Wednesday. The statue was unveiled in June 2016 by India's former President Pranab Mukherjee, who also gave a speech encouraging students to 'emulate and concretise' Gandhi's ideals. However shortly afterward lecturers started a petition to get rid of the statue, which had been located in the university's recreational quadrangle. According to the BBC, the petition said that Gandi was 'racist' and called for African heroes to be honoured instead. The professors said that the fact that the only historical figure memorialised on the university campus was not African was 'a slap in the face that undermines our struggles for autonomy, recognition and respect', The Guardian reported. They also reportedly cited several of Gandhi's writings which refer to black South Africans as 'kaffirs' (a highly offensive racist slur), accuse the South African government of trying to 'drag down' Indians to the level of 'half-heathen natives' and describe Indians as 'infinitely superior' to black people. He is remembered for his tactics of peaceful civil disobedience, which have inspired civil rights movements throughout the world. From age 23, Gandhi spent two decades living and working as a human rights lawyer in South Africa, where he developed his political and ethical views. While there he also faced persecution because of his race and served four prison terms totalling seven months for resisting racially-biased laws. Nana Adoma Asare Adei, a law student at the University of Ghana, told the BBC: 'Having his statue means that we stand for everything he stands for and if he stands for these things [his alleged racism], I don't think we should have his statue on campus.' The University of Ghana lecturers are not the only group to have raised objections to honouring Gandhi on the grounds that he was 'racist'. In October this year, construction work was stopped on a statue of the Indian leader being built in Malawi after more than 3,000 people signed a petition arguing against the statue citing the fact Gandhi had referred to black people as 'savages'. A judge granted an injunction saying that construction should be halted until a hearing could be carried out, or another court order was given. In their court application, activist group 'Gandhi Must Fall' said his remarks on black people 'have invited a sense of loathing and detestation.' The statue was being built in the city of Blantyre, Malawi's commercial capital, as part of a $10million construction project in conjunction with the city of Delhi. Malawai's foreign ministry official Isaac Munlo previously defended the statue, saying 'Gandhi promoted values of simplicity, fight against social evils'. Statues have sparked charged debates in Africa in recent years as the continent wrestles with the on-going legacy of colonialism and history of racism. Students in South Africa successfully campaigned in 2015 for the removal of a statue of Cecil Rhodes, a notoriously racist mining magnate who died in 1902, from the University of Cape Town campus. 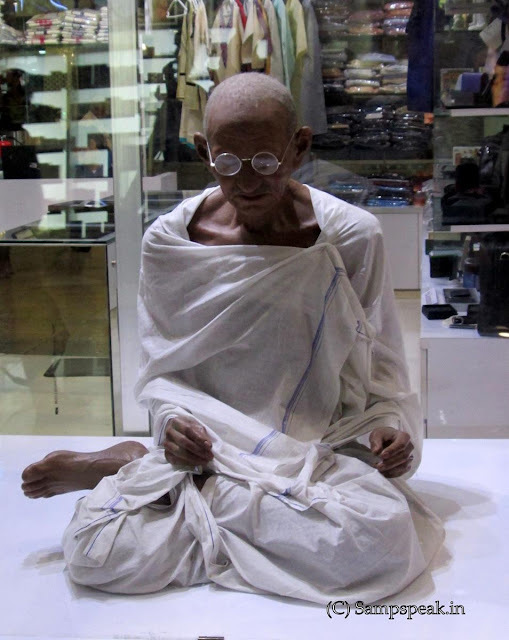 Dead now for nearly 70 years, Gandhi did not leave behind precise solutions for such problems. But his legacy will aid, not impede, efforts to find the solutions, even if we assume for a moment that between 1893 and 1914, Gandhi was prejudiced about Africa’s blacks and backed British imperialism. One needs to read history as a whole and not in parts for sometime Gandhi supported Imperialism too - This is no “discovery”. In fact, as Gandhi put it himself in his autobiography, the British Empire was one of his two passions at the start of the 20th century. (The other was nursing the sick.) Hadn’t Queen Victoria and other eminent Britons declared that in their empire, all the races would be equal and everyone would enjoy the freedoms of belief and expression and the rule of law? When Gandhi realised that the imperial claim was false, he became, as Winston Churchill and a succession of viceroys complained, the empire’s strongest foe, and India’s masses joined Gandhi in rebellion. In Nov 2015 New Zealand batsman Ross Taylor claimed that video umpire made a mistake to reprieve Nathan Lyon as the decision review system came under fire. The contentious call by Nigel Llong halted the Black Caps' charge in the third Test, allowing Australia to turn what appeared to be a sizeable first-innings deficit into a handy lead. The same Nigel Llong was under cloud again today at Perth. “ There's a big shout for caught behind down the leg-side for Paine, but it appears to have flicked his trousers instead. He has played a very gritty innings (eight off 26 balls) even if it hasn't been his prettiest knock.” ~ and that's stumps! Australia finish at 4-132 off 48 overs, with a lead of 175. Keep in mind Aaron Finch has not been sighted since he copped a nasty knock on the finger. India took 4-99 in the final session of the day. .. ..that is match status at Perth, 2nd Test – India Australia 2018 day 3 close of play. Nathan Lyon, the off-spinner has emerged as Australia’s best cricketer of the series thus far. The off-spinner took the key wicket of Ajinkya Rahane for 51 in the first over of the day then cleaned up the Indian tail to help Australia emerge with a 43-run first innings lead. Lyon snaffled a return catch from Ishant Sharma, Rishabh Pant mishit him to Mitchell Starc at long on and Jasprit Bumrah edged the offie to first slip to end India’s innings and give Lyon his fifth wicket for the innings. Lyon finished with the figures of 5/67 as his stellar series continued. He now has 13 wickets in this series thus far. While India played with 4 pacers – Ishant, Bumrah, Mohammad Shami and Umesh Yadav with Hanuma Vihari bowling parttime spin and taking 2 wickets, Aussies had one off-spinner and 3 pacers for the new ground at Perth. 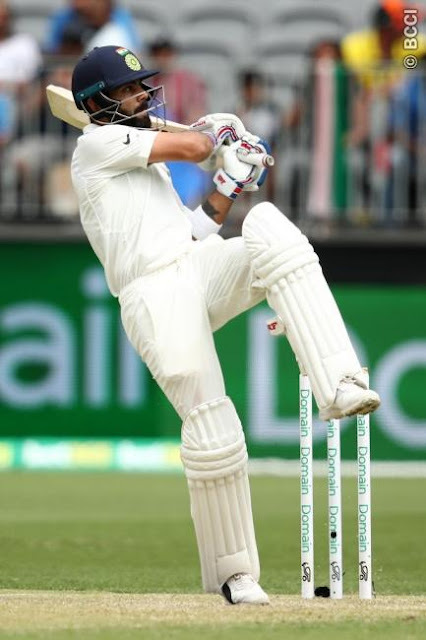 Kohli scored his 25th Test century on Sunday morning, becoming the first player to reach three figures in Test cricket at Perth Stadium, and celebrated in unique fashion as the swelling crowd showered him with applause. After he confidently bunted Australia spearhead Mitchell Starc down the ground to bring up his hundred, Kohli removed his helmet, put it on the ground, pointed to his bat then mimicked talking with his glove. .. .. and when got out – it was more of a poor Umpiring decision than anything else. Statistically his 25 - Centuries in Tests have come in 127 innings. Only Sir Don Bradman (in 68 innings) had completed 25 hundreds in fewer innings. Sachin Tendulkar and Sunil Gavaskar had taken 130 and 138 innings respectively. Kohli is the 21st batsman to register 25 or more centuries in Test cricket, and the fourth from India. His 6 tons in tests in Australia have come in just 19 innings. Only two visiting batsmen have scored more: nine centuries by Jack Hobbs in 45 innings and seven by Wally Hammond in 35 innings. Herbert Sutcliffe and Tendulkar also scored six centuries each. A master of a different World, is what he is becoming ! Umpire Decision Review System (DRS) is a technology-based system used in cricket to assist the match officials with their decision-making. On-field umpires may choose to consult with the third umpire (TV Umpire); players may request that the third umpire consider a decision of the on-field umpires (known as a Player Review). The main elements that have been used are television replays, technology that tracks the path of the ball and predicts what it would have done, microphones to detect small sounds made as the ball hits bat or pad, and infra-red imaging to detect temperature changes as the ball hits bat or pad. DRS was formally used in a Test in 2008, first used in an ODI in Jan 2011, and first used in a T20I in Oct 2017. Though it was first introduced in 2008 in a three-Test series between Srilanka and India, India had been a vociferous critic of the system claiming that it is not fool-proof. Today it was to the fore again. Peter Handscomb was n involved in a controversial catch which dismissed Virat Kohli today. The Victorian -fielding at second slip - was adamant he had taken a legitimate catch, having claimed the ball in his fingertips after Kohli had edged Pat Cummins just before lunch on day three at Optus Stadium. After several replays, video umpire Nigel Llong gave Kohli out after not finding conclusive evidence to overturn the on-field soft signal of out given by officiating umpire Kumar Dharmasena. Kohli made a sterling 123 to keep India in the match. At lunch the visitors were 7/252, 74 runs behind Australia's first innings total of 326. The things to blame are : the soft-signal (why a signal when unsure); the adamancy of the fielder and the TV Umpire Nigel Llong’s failure to see what was clear otherwise. The Cricketing world was divided. Former Australian captain Ricky Ponting believed Handscomb had taken a fair catch. "He's confident he got his hands underneath the ball, no conclusive evidence to overturn the soft signal out," Ponting said on Channel Seven. Mike Hussey, speaking on Fox Sports, was not as sure but did not believe Handscomb had been dishonest in claiming the catch. "I think he did manage to get his fingers underneath the ball," Hussey said. 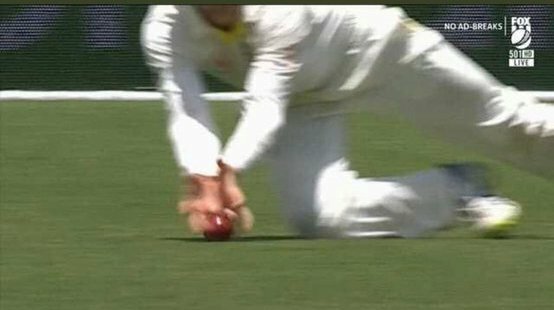 But he questioned if "some part of the ball was probably touching the ground" due to how far apart Handscomb's fingers were. Adam Gilchrist slammed it - “This putting the finger up and saying ‘yep, that’s out’, it reminds me of Ricky Ponting in Sydney some years ago in what ended up turning into one of the uglier Test matches,” he said. The TV replays shown to us clearly showed that ball touched ground before and no part of finger of Handscome was underneath it .. .. still a catch claimed, Dharmasena referred it with a soft-signal, Llong could not see despite technology and Kohli given out !! Remember in Jan 2008 at Sydney, India lost the match – more than a couple of umpiring errors and some controversies did contribute to hasten the end result in that match. Sourav Ganguly was sore on that occasion and commented that umpire Mark Benson should have consulted Steve Bucknor in adjudicating on the controversial catch which led to his dismissal in the second innings of the second Test. Batting on 51, Ganguly had edged Brett Lee low to Michael Clarke at second slip who immediately claimed the catch and the Australians celebrated before awaiting the umpire's decision. Ganguly, convinced that the catch hadn't carried, waited at the crease. Benson opted not to consult Bucknor at square leg and instead took Ricky Ponting's word that the catch was legitimate. It was among several decisions that went against India through the Test and played a big part in their defeat.